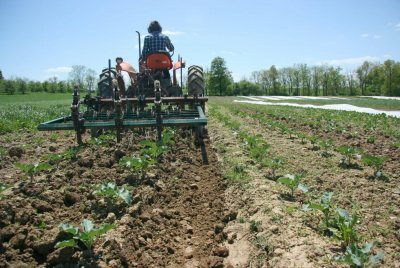 The big problem organic vegetable farmers confront every season is weed control. Technology has not revolutionized mechanical weed control as happened with chemical weed control over the past 30 years. However, using a cultivator today doesn’t need to be the dreaded practice of the past. Advancement in mechanical weed control for row crops comes in the form of automatic steering technology rather than cultivator design. Research has shown that automatic steering allows cultivators to be operated at twice the speed as when manual steering is used, maintaining the same levels of weed control and crop yield. Nearly as important is the elimination of the fatigue associated with the practice. The first tips to control weeds is using tillage and/or cultivators for stale seedbed preparation. The first tips to control weed is using tillage and/or cultivators for stale seedbed preparation. The premise behind stale seedbed management is to encourage weeds to germinate and then kill them before a crop is ever planted. The farmer uses a spading machine to do a final, shallow tillage pass immediately before planting a bed, or running through with the tine weeder on our Williams toolbar to wipe out the weeds before planting. In some cases the farmer will perform multiple stale seedbed cultivation passes before a crop is ever planted. This allows us to eliminate two or three generations of weeds before the farmer even sow a single seed. Stale bedding is a fast, easy, and extremely effective weed control strategy. Another key to effective cultivating is to get as close to crops as possible with cultivators. The farmer likes to get within two inches of our crops with aggressive tools like sweeps, and the farmer often run our tine weeder as a blind cultivator right through the crop. As the farmer becomes more familiar with cultivators to use them more aggressively every year and have found that our crops have greatly benefitted. Mechanical cultivation is the cornerstone of farm’s weed management plan. The farmer relies heavily on cover crops, mulch, rotation, and fallowing land as well, but still have found that active weed control methods are vital to the quality and quantity of harvest. Fields clean of weeds are not only pleasing to the eye; they are easier to harvest, harbor less diseases, and use water and nutrients more efficiently. 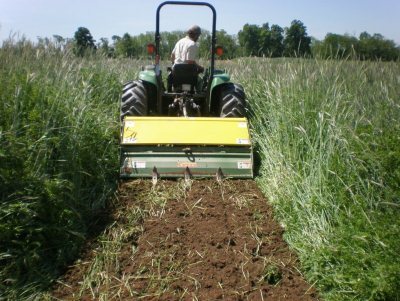 Thus an explanation of Tips of using Mechanical Cultivation for Weed Control. 0 Response to "Tips of Using Mechanical Cultivation for Weed Control"